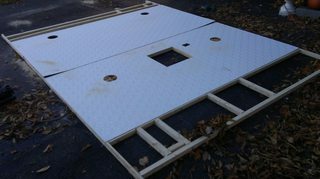 My motorhome has some roof damage but I can't afford to replace the entire roof. I had an estimate done and the quote was around $6,000. it's; not worth that. I either want to patch and sell or do repairs and keep for several more years. 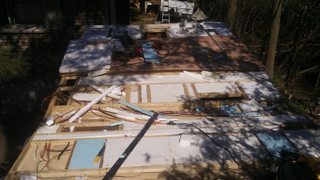 The roof has peeled back in places and the plywood has delaminated. Can I cut out the bad stuff and replace that with new plywood, the apply a roof sealant? I would have someone do the work since I can no longer go on the roof. There is also water damage inside from that hole. theres no good way to say. till you open it up and see the rotted area. it would all be a guess. but being a hole on the inside rot could be very bad. might call a rv tech mobil repair in your area they might know people who do this work on the side and cheaper. I assume the $6,000 was the replace the roof ? What about the rest of the rot ? Once this gets opened up you might find so much damage beyond what you can see now. Water can travel to other areas causing damage that you are not aware of until you open it up. I would be concerned about mold and health related issues. If this is an older rv with not too much value, then you really need to talk to someone who can assess what's going on. 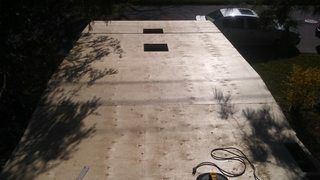 You 'could' rip up the damaged roof material, lay down new plywood and then do a Rhino Liner cover over the new plywood. One 'could' also rip up all the plywood and shoot a whole new membrane. Then pull down the damaged interior and repair. I also have to add....I hope that you intend to disclose any and all damage to a potential buyer. I have a Blog..about stuff, some of which is RV'ing. thanks to you who replied. I did have the roof checked by an RV repair place. I can't afford the repairs to the entire roof. I do realize this could open a 'can of worms' but I won't know until I do it. Yes I would certainly use full disclosure about the damage. i will probably keep it for a few years if I can repair it properly. Check into enternabond products. They have a variety of products and they work. A patch is just that. A temporary fix. The wall studs and floor are likely wet and starting to rot. Thanks to you who gave suggestions on product or methods. Right now I need ideas on what to look for and how to fix it. I don't plan on patching it. I plan on replacing the plywood from the a/c to the front vent. Please keep the encouragement and suggestions coming.